It is officially T-1 week! This time next week I’ll officially be starting study towards a Master of Evaluation at the University of Melbourne. It’s an incredibly exciting and nervous time. Exciting because I’ve been thinking about some form of graduate study for a few years now, as I consider what my next career step will be. Nervous, because I haven’t done any sustained formal university-level study in almost 10 years – and undergraduate when you’re fresh out of high school and have no idea what you’re doing is quite different! At the same time, there’ll be students starting in the first few topics of our new Bachelor of Healthy Ageing – a brand new fully online degree that I’m leading the educational design on. As I wrote the preparation and orientation material for these topics, I realised I was drawing on my own experience as an apprehensive and anxious almost student and some of the best practice advice out there. What might assessment that leverages the potential of technology to more efficiently and effectively assess at scale look like? Part technology, part alien, but human underneath…? Mike, who I had the absolute pleasure of meeting at the edX Global Forum in 2015, makes an interesting case about the issues facing the current iteration of LMSs and a suggestion for fixing it. He points to a future LMS that is clean, simple and heavily reliant on integration; where the “LMS” that an institution uses is focuses on collating learners into a learning group (i.e. a course), presenting a variety of learning activities (via LTI or API integration) and extracting all of that delicious grade and ‘engagement’ data out into an SIS. Is it just me, or does this sound like a stripped down Moodle, i.e. could it be, maybe, almost, already here or within our grasp? Is there anyone in the LMS market now who could deliver this? Some have more of this feature, some do that feature better, some structure the course in this way, some guide you to design a course in that way, some offer more flexibility as a designer v a learner, etc. The similarities, though – presentation of learning content/activities, learner management (comms, enrolments, progress, etc), and learning management (lists of courses, gradebook) – definitely exist, if in overall functionality and not in the exact manner of workflow. The following is a copy of an email I sent to Minister Dutton this morning, after reading that more ‘workshops’ are scheduled to be delivered in Australia early this year by a group renowned for perpetuating and perpetrating violence and abusive behaviour towards women and, perhaps worst of all, profiting off the incitement of this deplorable and despicable behaviour in others. If you agree, you can contact Minister Dutton and/or sign the Change.Org petition to deport/revoke the visas of those involved. I write to you to request that the visas of anyone involved with Real Social Dynamics, including Julien Blanc, Owen Cook and Jeff Allen, be revoked because of their public history of perpetrating and inciting in others violence against women. “”Why do male perpetrators commit violent acts against women? This man and this team are part of the domestic violence problem globally and contribute to the problem here in Australia. We know how many women died at the hands of intimate partners last year – the belief that it’s acceptable to behave in that way starts with the belief that behaviour such as belittling, physically restraining, physically harming, mentally abusing women is also acceptable. Our government needs to prove that women deserve respect. That decent human beings respect women. That healthy relationships form out of respect for women. That women are not sexual objects to be acquired and won. Our government can take action by refusing the visas and releasing a public statement as to the reasons behind it. Do you think that women are less worthy than men, Minister Dutton? Do you think that women are less deserving of respect and safety? Do you believe that it is acceptable that men disrespect women? Do you think that men should have the right to commit violent acts against women? I feel rested after a week holidaying at home in NZ. I got to bathe in the wonderful comfort of family and familiarity, so warm that even the 40+ degree summer days in South Australia can’t quite compete. I got to see NZ’s beauty as new again through Mark’s eyes. I switched off from work completely – the first Xmas/New Year’s Day break in a few years where I could actually do that. And on my return home I got an afternoon/evening of doge cuddles, who smelled of home and happiness and love. And now, it’s the first day of work for the calendar year. I am optimistic again. Enthusiastic again. Feeling curious and empowered again. I have big plans for today, and for 2016. Recent years have felt like hard slog – demolishing, rebuilding, discovery, negotiating, crawling, recovery. Whereas previous years have required a complete demolish and rebuild of foundations – sometimes huddling in a caravan, avoiding leaks as torrential rain pours that halts any work – this year feels different. The foundations are complete and strong. The scaffold is there – it’s time to make it whole and beautiful. Reading through The Thesis Whisperer’s blog post about the exploring options for journal article titles (in the context of her workshop on writing a journal article in 1 week), I stumbled upon the her challenge to free-write for 5 minutes every day for 2 weeks. It so happens that every day, on average, I have 2x about 30 minutes of train travel of commute between home and work. I keep thinking I should be using this time more productively. I even had grand notions of using the time each day to draft/review/publish a blog post, in order to try and write at least once a week the myriad of thoughts that flow through my head. So far, that’s happened sporadically. But now, I think I want to try it again. I feel like it’s similar to quitting smoking – every time you quit you’re closer to being a non-smoker long-term. Every cigarette you don’t smoke you win, you save money, you increase your health. I really despise cigarette smoking and have tried multiple times to encourage my cousins to quit (once I made one cousin promise she would cut down one cigarette a week until she smoked none, because I’d seen that somewhere and it worked – it turned out she was just hiding her cigarettes and going down the path outside the house to smoke them. When I found out, I threw ALL her cigarettes in the bin, and threw water over them, just to be sure. That was almost a whole packet, I think. Perhaps $20 or so in those days?). I’ve tried to think of ways to make this happen for myself more easily. I’ll admit, I’ve found the 20-25 mins or so of train commute (by the time I sit down and settle my bags, etc) to be a decent amount of time to write a few paragraphs about something I find interesting or that’s on my mind. It’s then turning it into publishing that’s the difficult part. Perhaps if I tried a version of this 5 minute challenge from the Thesis Whisperer? I’ve created a spotify playlist of instrumental songs that are approximately 5 minutes long (4:50 – 5:30 to be exact). The idea being I can use 5-10 minutes to write, 5 minutes to post. I’m hoping – thinking that perhaps 15 minutes of almost-free-writing might work? I use evernote to capture all my notes, including interesting links, thoughts, snippets of blog ideas and drafting posts. I find it much easier to free-write on the computer sometimes. Other times, I use a notebook that I can then take a photo and save it up into Evernote and it gets scanned. It’s rather handy. Again, I digress. It’s almost the end of 10 minutes now. I should summarise and have a point. 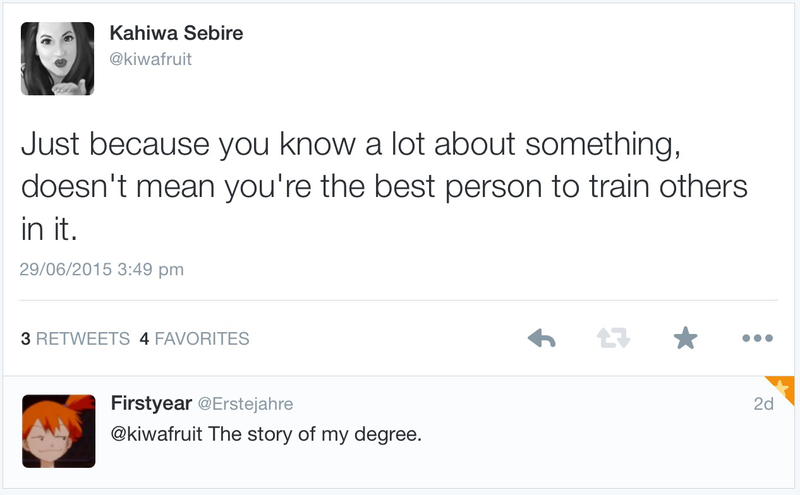 My point will be this: I’m going to, once again, try a new method to encourage reflective thinking in myself. And use this blog to do that. Head picture was selected from Unsplash, using the Unsplash Instant Chrome Extension. When I was in high school, I was Vice-Captain of the girl’s First XI cricket team. Not because I was especially good, in fact I was average-poor most days, but mostly because only 12 people turned up to tryouts. I was, however, pretty good at keeping spirits up on the field and also pretty good at translating and articulating coach’s instructions on how to execute a particular skill better, even if I couldn’t actually demonstrate it myself. I knew that when bowling you want your body to be almost side-on and the arm with the ball to make a wide arc with your upper arm grazing your ear as you step through. When my friends struggled with algebra or calculus concepts, or how to interpret the wordy physics exercises or couldn’t wrap their heads around how to conjugate ‘venir’ v ‘ir’ in French, they didn’t often ask the teacher, they asked me. Whereas our teachers might simply repeat the formula or answer or just move on, I could come up with ways to explain or other examples that made more sense or different interpretations of the formula. When I worked at a linen and haberdashery store during university, my colleagues who had worked there for years and knew the processes and products in and out struggled to work out how to impart that knowledge on me – preferring to make me stand and watch or rattling off step after step with no context. Unless you’ve worked with me, you may not know this, but I am the self-proclaimed Queen of “Winging It”. It’s the curse of procrastinators everywhere that what must eventually be done is done under duress extreme time pressure. Sooner or later, if you’re a bad learner not unlike me, that means throwing caution to the wind and just doing it. The years I have spent honing this craft have resulted in an innate belief that I can do almost anything with enough pressure and confidence. 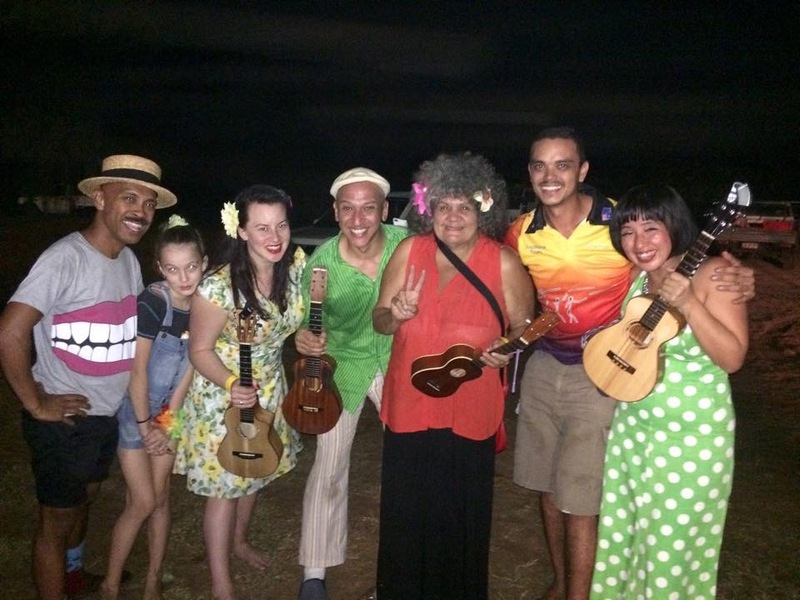 This weekend I was a headline performer at the Mandorah Ukulele and Folk Festival.